My friend Edward Lifson has been fighting a lonely one-man crusade opposing the demolition of the building you see pictured above, the Test Cell building and adjacent walls at Federal and 35th at IIT, designed by the master architect of the school's campus, Mies van der Rohe, to be replaced by a new Metra station. Pretty trivial stuff, right? No less than Tribune architecture critic Blair Kamin quickly dismissed the ensemble as "utterly dispensable." In the imperial words of his headline writer, "One Mies building on the IIT campus can go." I was initially persuaded by Kamin's arguments - it was "a clunky brick box", "mediocre." Kamin buttressed his case by quoting Anne Haaker, the Illinois preservation officer who signed the building's death warrant, who based her decision on the fact that the structure was not built precisely to Mies' original specifications and had been altered over time. The view down Federal Street is the only one that puts the industrial aesthetic of Mies's IIT buildings, not in a park-like landscape to help the medicine go down, but directly within the industrial context of a gritty city street running parallel to a set of railroad tracks. If you don't care much for Mies, you probably don't see much beyond ugly. But if you appreciate what he accomplished, you can't miss the incredible, rough beauty. 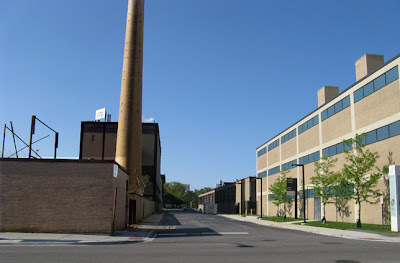 The abject Test Cell, a far more accomplished conception than the critics would lead you to believe, is indispensable to that view, a variant of the Miesian corner in the way it mediates the turn from 35th street into the classic assembly of steel, glass and brick industrial buildings on Federal. In the Metra design, it's replaced with a generically prettified plaza, an empty, characterless void that has absolutely no relationship to the IIT complex, and that thoughtlessly trashes any idea of context. That view down Federal isn't just another generic city street. 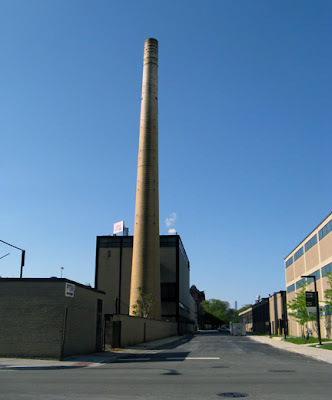 It's modernism alley, the place where Chicago architecture was reborn. 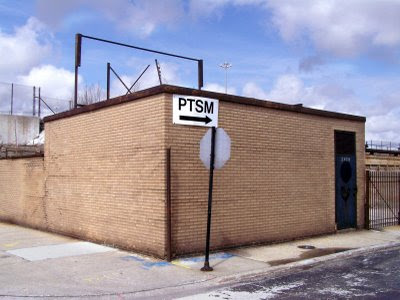 And that homely sentry station on the corner is its perfect pivot point. There are certainly good arguments for a Metra station at 35th, now made possible by a $6.8 million infusion of stimulus money towards its nearly $12 million cost. You can, without strain, argue the merits of the Test Cell as built and modified. You can even, as did Blair, buy hook, line and sinker into the bureaucrat's injunction that public discussion must be quickly silenced lest it risk a delay in the completion of a station we've somehow done without for over 50 years. You can sit back with a mournful sigh and acquiesce to the idea that this is way power works in Chicago (the station is a pet project of district Congressman Bobby Rush), and it's a trifle compared to the loss to the Walter Gropius buildings on the Michael Reese campus. But to idly declare that it won't inflict irreparable violence on one of the most seminal streetviews in Chicago architecture is a willful act of blindness. My wife is a student on the IIT campus and having spent many a night picking her up from the architecture building, I believe the campus suffers from an overblown sense of preserving Mies no matter what. His Crown Building is not even used to its full potential of adaptability and its openness to take advantage of new technology such as laptops and wifi. Instead students sit on the same stools which they all complain about. The IIT campus can't be a stagnant museum to Mies if it is to grow as a university. The changing of this building is stepping into the reality that the area around the Cell is not as gritty and industrial as it used to be. Furniture notwithstanding, I think the two recent, strongly contemporary buildings by Jahn and Koolhaas demonstrate IIT is not paralyzed by Mies worship. But if you're in possession of some of the most important structures in 20th century architecture, a proper stewardship is only appropriate. If the Test Cell corner was rescued from its current derelict state, the logic behind preserving that streetscape would become apparent and embraced. As to the area not being "as gritty and industrial as it used to be", all the more reason not to degrade the past with an ill-fitting veneer of current taste, but to exploit the contrast that makes both elements richer, especially when one them is a unique, essential historical vista that cannot be duplicated. Point of correction--SR Crown Hall, and the IIT campus, is a wireless zone and all students, faculty, and staff are able to use it. Now, why we don't grant access to non-IIT users and the community is a separate issue. This doesn't change the heart of JP's argument, but I post for the sake of accuracy. I greatly prefer the inviting, human-scale design of the train station to the assault on human comfort that is Mies. Still, it's hard to think that the overall effect will be improved by jamming mismatched things together. It does look as though the Test Cell could easily be reincorporated into a design for the train station, leaving open the question of why it "must" be torn down. I would repurpose it as the train station entrance, and put brightly-colored plastic lawn chairs on the roof. The test cell building is a test I would rather not take again... this is a structure most likely drawn up by Mies' students in an autumn studio class charette. I spent a good portion of my 2nd year at IIT drawing a brick structure (brick-by-brick) that is very similar to this with Alfred Caldwell. The southwest corner of IIT's campus is not what I would include as part of the campus... but the campus' industrial park. While a student at IIT, the only good us I found for this section of the campus is as an industrial/post-apocalyptic backdrop for photographing my models. I also know that this is a common area for Sox fans to relieve themselves. The train station will revitalize this portion of IIT, more than a brick shed has ever done. I agree a proper stewardship is appropriate. The idea of incorporating the building into the train station is intriguing. In Chicago we are stuck between the preserve or knock down paralysis (ignoring the current solution of propping up facades which is not really a solution). The two new buildings are good architecture for moving forward. However, the MIES buildings can't be preserved for ever exactly as the day when they were built either. While Crowne Hall should probably never be altered, there are other buildings that students sit in working at computers without being able to look out a window because the building was previously used for labs. As the campus changes, the campus needs to be able to adapt. Planning wise, the campus is not perfect either. To get to the red line at night is not the most pleasant walk. This train station should help although I have learned not to judge a design based on computer renderings. Thanks for this and many other articles, it is great to hear views on why a building should stand when everyone wants to tear it down quickly. Yes, we've really had some thoughtful comments here. Thanks. What really strikes me is that when you look at the Metra rendering, the only thing the Test Cell area is being used for is that rather generic plaza, so, other than the designers need to obliterate, I'm at a loss why the Test Cell and vista from Federal couldn't be incorporated into what would then be a much more contextual - and interesting - plaza and access area to the station ramps. I agree with most everything JP said about IIT being consumed by Mies worship. As a member of the IIT community, I understand this all too well. While I certainly understand the important contributions Mies made to architecture, I will never be mistaken for a fan. And as a side note, While the State Street Village building is quite impressive and fun to look at, it does have quite a few problems. The new Metra station looks like it came straight out of the original Donkey Kong video game. If the Test Cell corner was rescued from its current derelict state, the logic behind preserving that streetscape would become apparent and embraced.Perhaps, but who has the will to pursue such a project? Getting the money to restore S.R. Crown Hall a few years ago was an enormous project, as is the current project to restore Mies's Carr Chapel on campus (Mies's only religious building), which is only partially funded at the moment. Those are iconic buildings that are used every day. Who would pay for the restoration of the Test Cell? How many years would it sit unused, with no new Metra stop for the IIT community, White Sox fans, and architecture lovers, while a (possibly futile) pursuit of funds is undertaken? No one's saying no Metra station. The more you look at the design of the Metra station, where the Test Cell stands is wrecked for an open plaza, the more apparent it becomes that the Test Cell could be easily incorporated into the design of that plaza, making for a less generic and more interesting space, as well. As to cost, we're not talking about sanding down and restoring a huge steel structure, but a fairly small brick building, with a correspondingly relatively small cost, as well. You can build a station and keep the Test Cell. It is a challenge and an opportunity. I think it is clear that the commercial functions that have been built down the street are a success and there is room for much more retail in that part of town. 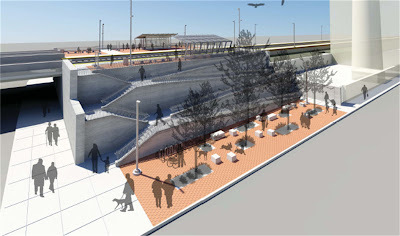 The current proposal for the Metra Station is not very well thought out but a station would be a great benefit.